275 gallon totes or containers available. $ 120/ea for food grade (previously contained sugar based food products) Non-food grade – Call 317.225.4732 for pricing. We also have NON-food grade IBC with poly resin or waste oil previously in them–they are in excellent shape. $75 each for non-food grade totes. *Bulk discounts available. 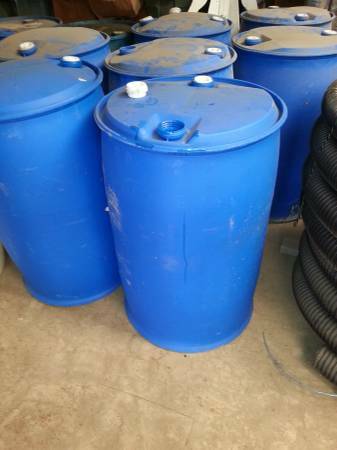 55 Gallon Food Grade Drums Various liquid or syrup food products previously in them, current batch mostly tapioca syrup–but most are rinsed and washed out. 2″ bung with threaded cap with seal $20/ea 100′s of uses, here are just a few: Rainwater collection, portable water storage, maple syrup collection, aquaponics, livestock feed, feed trough, bird seed, etc. Request More Info Call 317.225.4732 to place your order today! Bulk discounts available many available. Delivery available upon request.